Beverly Hills, 90210 Season 1 Outfits That You Could Still Rock Today 2018's cold-shoulder tops have got nothing on 1990's cold-shoulder tops. In fact, one of the most enjoyable parts about streaming classic CBS All Access shows like Beverly Hills, 90210 is perusing the (occasionally outrageous) wardrobe. Of course, not all of it stands the test of time (oversized patterned vests, yeesh), but you'd be amazed at how many styles could still be found on Rodeo Drive today. Because we can't get enough of 90210's groundbreaking '90s style, let's return to some of our favorite ensembles from Season 1—and, more specifically, the ones you could still totally rock now. Neon spandex: The brightly hued headband is a little much, but couldn't you see Brenda's entire color-blocked athleisure ensemble for sale in Topshop or Urban Outfitters? Also, this look goes perfectly with Brenda's realization that her twin brother, Brandon, just lost his virginity while his ex-girlfriend, Sheryl, was visiting from Minneapolis. See Brenda's eye-catching elastic look in the "The First Time" episode. Ripped jeans and Louis Vuitton: Who else is living for these looks on Brenda and Kelly? Brenda looks very proto-grunge in ripped jeans and black halter-neck top. Kelly's wide-necked leotard is exceptionally flattering, too. Plus, get a load of that oh-so-casual Louis Vuitton bag. Brenda may be playing copycat a little with her new Beverly Hills bestie (because she basically has no chill about envying Kelly's supervision-free life), but we're still here for it. See a matchy-matchy Brenda and Kelly in "Perfect Mom." Slouchy sweaters: Typically seen in ultra-tight, off-the-shoulder tops and dresses, Donna (Tori Spelling) occasionally goes for a more relaxed look in this slouchy, mustard-colored sweater. Though she's not given a TON of storylines in Season 1—for example, this look is from an episode that's less about Miss Martin and more about the Walsh twins being peer-pressured to drink at parties—it doesn't take long to realize that our girl Donna is a total fashion chameleon. Admire Donna's slouchy sweater style in "B.Y.O.B." Off-the-shoulder red crochet sweater: Brenda's traveling-to-Palm Springs-to-maybe-hook-up-with-Dylan look is just the cutest. Also, if you wanted to dig into the possible psychology behind this choice of cardigan, you could totally make the case for the bright-red outerwear symbolizing Brenda's sexual awakening—and the modest white T-shirt underneath signifying her nerves and trepidation. Good thing that old lady friend of Dylan's was in the hotel room to act as an inadvertent blocker! Check out Brenda's red-on-white sweater look in "Palm Springs Weekend." Going goth: Speaking of the Palm Springs episode, remember these poolside goths?! As any skilled fashionista knows, all-black-everything never goes out of style. In the immortal words of Coco Chanel, "For me, black is not dark; it's poetic." Get the full somber-in-the-sun experience in "Palm Springs Weekend." Brenda's bangs, though: Later in Season 1 is when Brenda's bangs get really good. Also, this rust-colored slouchy sweater is lovely on her. But the look that really clinches this episode where the gang learns their collective SAT scores? Donna in a classic jean jacket and bold red lip. Witness Brenda's excellent fringe in "April Is The Cruelest Month." Denim on denim: By Episode 22, "Home Again," after Brenda and Brandon have spent nearly a year in Beverly Hills, the Walsh twins find out they're moving back to Minneapolis. Which is to say, Brenda's fashion—and hair—game is growing stronger and stronger by the episode. Here, she's pulling off denim-on-denim exceptionally well. Check out more of Brenda's denim-on-denim look in "Home Again." Bonus! Carol's LBD: Let's rewind for a sec! Our girl Cindy Walsh (Carol Potter) deserves a special shout-out because she looks dynamite in this cold-shoulder LBD. Show those kids what class looks like, Cindy! See Cindy's amazing cold-shoulder LBD in "One On One." Now that we've taken a proper stroll down 90210 fashion-memory lane, we bet you're feeling pretty inspired to hunt through your local vintage racks, right? Of course! And who could blame you? 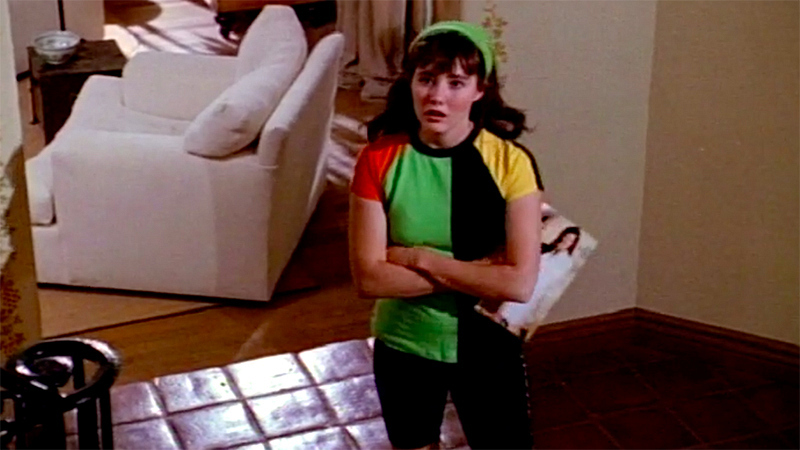 Thanks to CBS All Access, which has the entire first season of Beverly Hills, 90210 available to stream, you can start planning your own early '90s looks, complete with slouchy sweaters, cold-shoulder LBDs, ripped jeans, bodysuits, and that ever-dependable combo of denim-on-denim. Read to get started? Stream the pilot episode of Beverly Hills, 90201 on CBS All Access now!